Real-Time Responsive Ads: this new ad tag technology enables real-time auto-detection of devices and screen sizes in order for the right ad or campaign to be delivered for a particular traffic type. This feature enables owners of responsive sites to manage their inventory based on traffic/device type using a single ad tag. In-View Loading: ad only loads once when in the viewport, i.e. when the ad is in the visible part of the screen. This is a major help at a time when many publishers are coming under pressure to demonstrate strong viewability measures. Single Ad Call per Page: in order to minimise delays all the tags on the page are called in are aggregated into a single request. This significantly reduces page load times. Why Are Intelligent Ad Tags Important Now? The Internet has become very complicated indeed! There are multiple device categories, thousands of device types, all working with various operating systems and browsers. In addition, there is the web ecosystem and a semi-parallel app ecosystem. Delivering the right creative payload in this environment requires that ad must somehow adapt the payload for each end-user so the marketing message comes through as intended. Marketers or sales teams find it hard to keep up with this ever-changing and highly complex environment. It can be time-consuming and frustrating to manage campaigns or inventory in this ecosystem. Unless Intelligent Ad Tags are used. This new architecture results in two important benefits: firstly client-side loading and processing are massively reduced and this significantly improves the user experience. Secondly, it offers the opportunity to customise/personalise ads in in real-time on a device by device basis. This offers a lot more flexibility of what ad can be shown to each individual end user. What Are Intelligent Ad Tags? 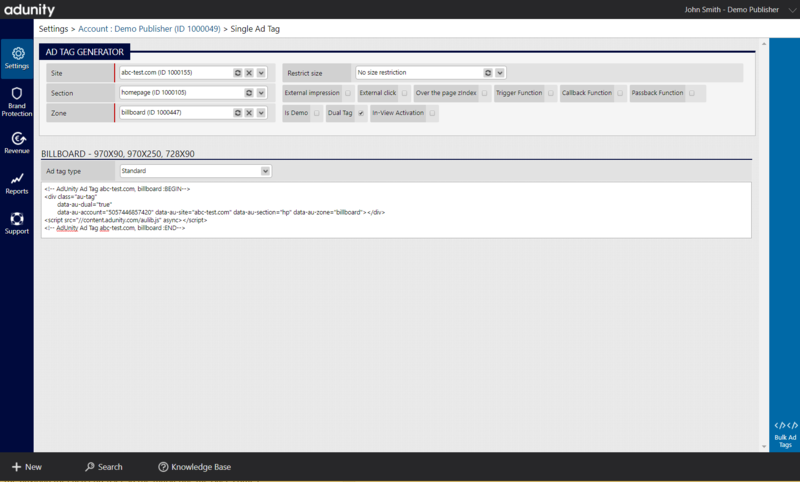 AdUnity’s intelligent ad tags are HTML based tags. These are generated by AdUnity’s ad tag generator, which can be found in AUX (AdUnity Exchange), on the Enterprise Ad Server For Publishers and on the Enterprise Ad Server For Advertisers. Features such as Responsive Ads or In-View Loading are options that can be configured on the tag when the tag is generated as shown below. 1. Real-Time Responsive Ads: the huge benefit of real-time responsive ads is that it enables the seamless delivery of cross-screen campaigns (from an agency perspective) or the efficient use of existing multi-screen inventory (from a publisher perspective). AdUnity has offered real-time responsive ads for a while, however, this the new ad tag technology enables (if selected) publishers of responsive sites to sell their inventory according to traffic/device type with a single tag. This means publishers of responsive sites, could sell their desktop inventory for a higher rate than their mobile inventory as if they had separate sites. Inventory management and reporting are similarly simplified for responsive sites. The publisher can also set size restrictions, if required, for very fine grain control. 2. In-View Loading: AdUnity’s Intelligent Ad Tag can be configured to load an ad only when the placement is in the viewport, i.e. when the ad is in the visible part of the screen. At a time when both publishers and agencies are coming under pressure because of lack of viewability, this feature makes inventory and campaign management that much easier, as it is built into the platform. Costly third-party tools are not needed. 4. Advanced Asynchronous Ad Loading: AdUnity has significantly improved how ads are loaded onto a web page. The ad library now loads asynchronously, not affecting web page resources and hence creating a much better user experience. 5. Publisher Click Tracking (for agency ad tags): it is often difficult to configure click tracking when the creative payload is being served by an external system (agency or advertiser). The AdUnity’s new Intelligent Ad Tag can be very easily configured to count clicks for measurement purposes even for third-party ad servers that do not provide tracking feature/macros. 6. Time-Stamped Ad Events: all ad events are time stamped. This includes request and load times. This aids debugging and forms a part of AdUnity’s GDPR compliance preparation. 7. Multiple Use of Same Ad Tag on Single Page: many sites now have unlimited or very deep scroll depths. In such a scenario it may be required to run the same ad tags repeatedly for ease of trafficking. The new Intelligent Ad Tag allows for multiple uses of the same tag throughout the page without conflict or reporting issues. 8. Faster and simpler DFP integration: The ad tag generator now has an option for aAdX/AdSense or Google Publisher/DFP passback tags. The tag created with this option automatically sets the passback to Google Publisher Tag for each placement.